Waking up at 4:30 in the morning to the sound of the wind howling, and rain hitting my house was not how I envisioned race day for running the RAM HOT CHOCOLATE 15k. 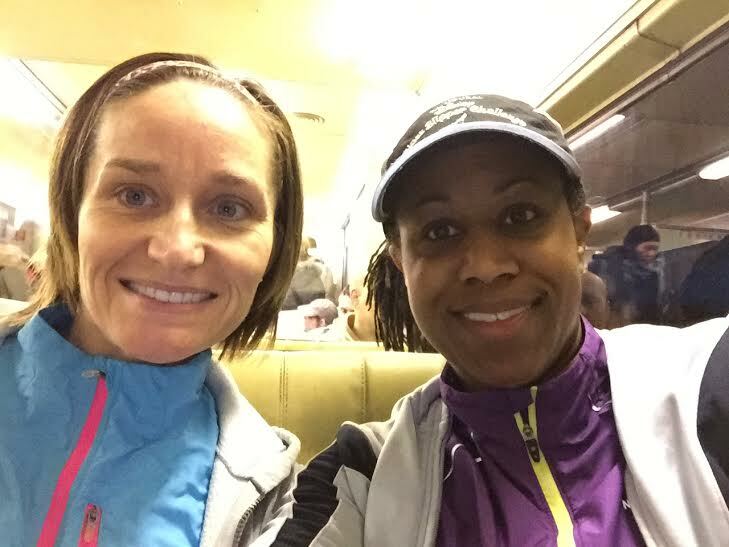 Shaking off the bad weather, I headed out at 5:45am to meet my friend and running partner Kate Fontaine at the PATCO station. 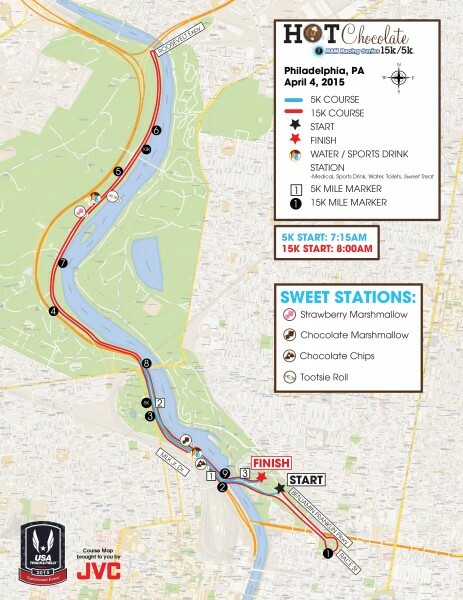 Riding over the Delaware River in a full subway car filled with other runners, I was excited to see how this race would treat me. This would be my longest distance since running The Philadelphia Marathon in November of 2014 and I only got to 6.5 miles while training. We were greeted with clearing skies and no rain when we came from underground, but the 40 MPH winds decided to stay behind to be with us during the race. 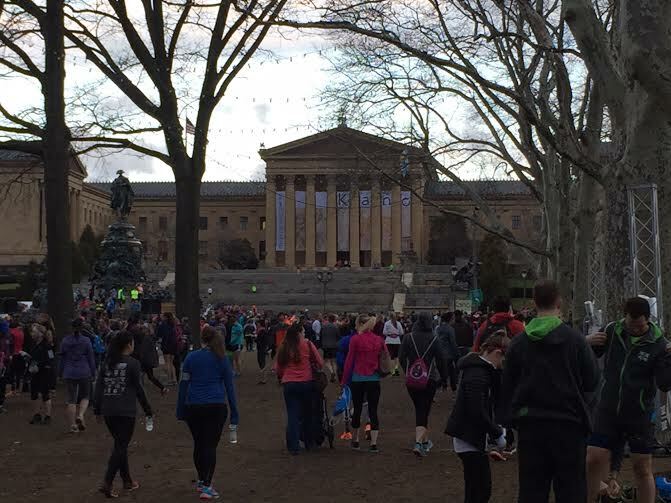 We made it to Eakins Oval in front of the Philadelphia Art Museum in plenty of time to check our gear and arrive to our given running corrals. Everything was organized and the volunteers were very friendly. After saying goodbye to the 5k runners, we lined up to begin our race with our fellow corral J friends. With the chilly wind hitting our faces, we were off. Running around the Oval, we headed away from the Art Museum and towards Kelly Drive. The wind was blowing towards us for a couple of miles making it a challenge. Before the race I was back and forth about whether I should run my race without stopping or do walk and run intervals. 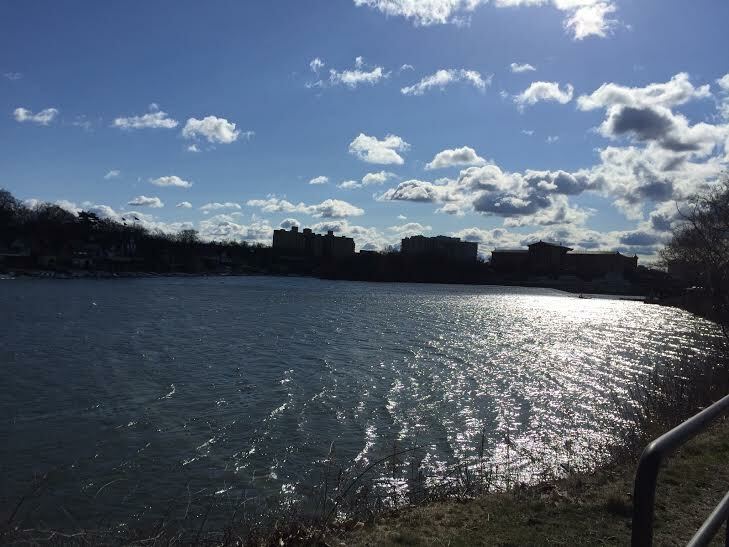 After a powerful gust of wind hit me head on at mile 1.15, I decided to do run/walk intervals in order to conserve energy. 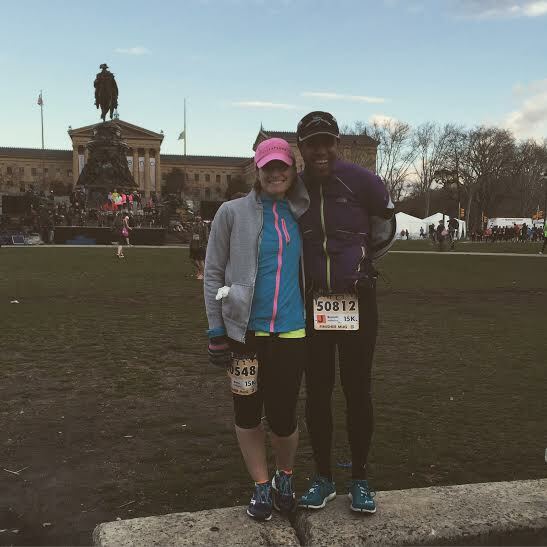 The course was familiar (Philadelphia Marathon flashbacks) and the scenic course made me forget that the wind was howling at us. There were plenty of water stations for the runners, but I think because of the time of the race (8am) and the weather (windy and cold) the course didn’t have a lot of crowds to cheer us on while on Kelly Drive. However the spirit of the fellow runners, as well as the scenery kept me company. Once we got to the turn around after mile 5, the wind was at our backs and I felt relaxed and ready to get though the next 4.3 miles. In the home stretch, we were greeted by large crowds cheering us to the finish. This made up for the lack of spectators on the course. Even with my last minute decision to run intervals, I was able to finish the race at 1:36 and felt great at the finish line. I met up with Kate (we separated during the race) who ran an awesome race and finished at 1:23, and we were off to get our chocolate grub on! 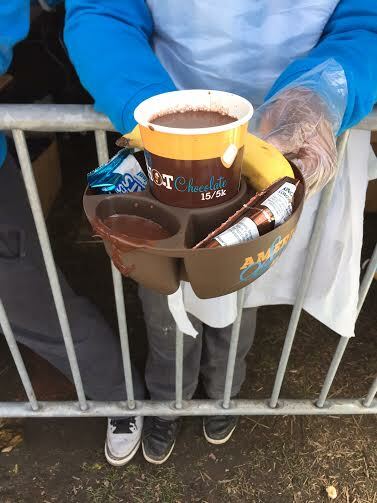 Our finisher’s mugs were full of edible goodies. We received a hot cup of cocoa, banana, chocolate fondue with things to dip in it such as a Rice Krispy treat, marshmallow, and pretzels. As we sat eating our goodies while on the verge of a sugar coma, we talked about what we thought of the race. We both agreed it was very well organized, a beautiful course, and we enjoyed the chocolate party afterwards. My favorite thing has to be the medal of a half eaten chocolate bar with the Liberty Bell on it and our warm and comfy hoodie we received (who needs another tech shirt?). 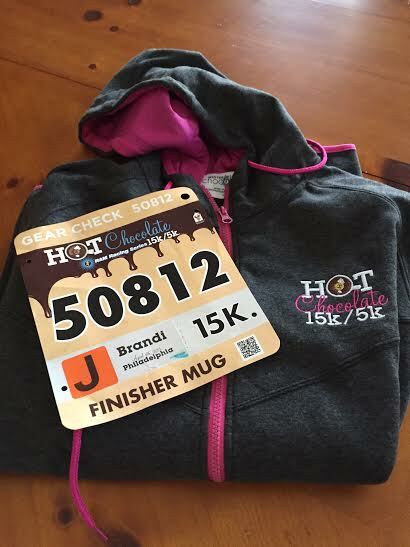 So if you like to run, you love chocolate, this race is perfect for you! Where else can you get runners high and a sugar high all in one? 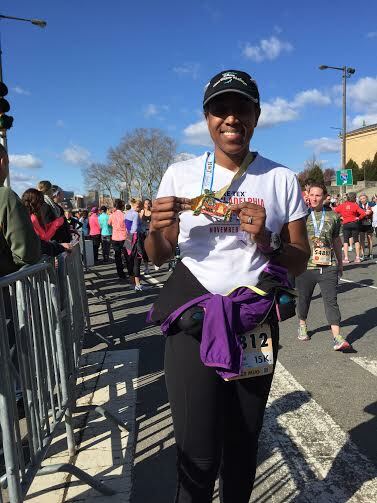 Brandi B. Dockett, CPT, is an ACE certified personal trainer, AFAA group fitness instructor, Spin instructor, running coach, and Owner of B FIT FITNESS SERVICES, LLC. 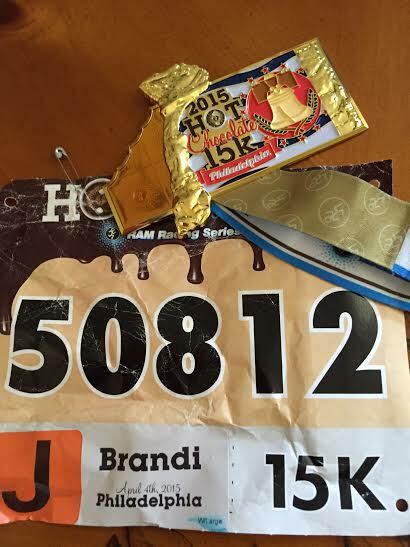 Brandi loves running, cooking, traveling, and spending time with her friends, husband and 2 daughters! You can find her on Twitter, Instagram, and Facebook. 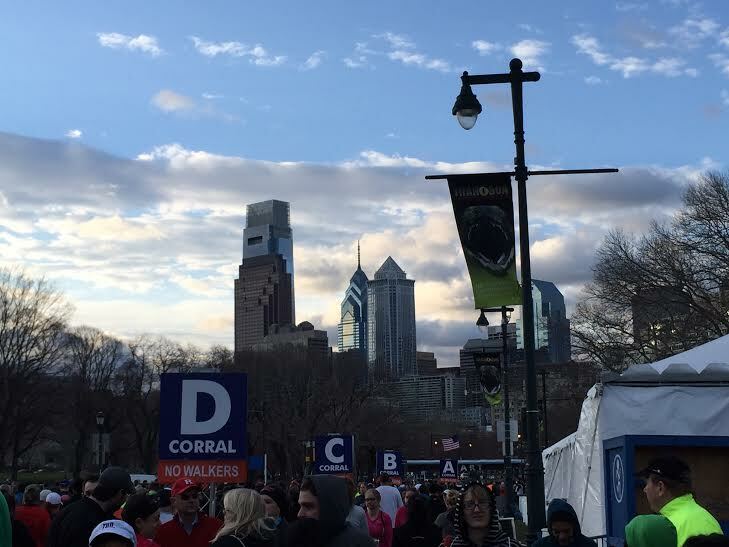 This entry was posted in Guest Post, Race Recap and tagged Brandi Dockett, guest post, hot chocolate 15k, philadelphia, philly, race recap. Bookmark the permalink. Great job! I love the medal too!